If you’ve been following Julie Czerneda’s writing career, the phrase “a new Clan Chronicles novel!” is music to your ears. I discovered Czerneda through her Species Imperative trilogy, and quickly fell in love with her invitingly conversational writing style, her characterization, and the way she writes alien species. Seriously, this woman is the ultimate master of writing convincing alien species. Formally trained as a biologist, Czerneda’s plots touch on evolution, biology, ecology, and how it’s all related. She’ll introduce you to an alien civilization and then prove their population isn’t living on their planet of origin, she’ll give a species a strong evolutionary process and then prove that it doesn’t quite work as planned. It’s true, physics and math will get us to the stars, but it’s biology that will give us the answers to whatever and whoever we find living out there. I think the biggest question surrounding This Gulf of Time and Stars is can readers new to this series jump in here? The answer is it depends on the reader. If you don’t mind feeling a little in the deep end (some of my favorite authors have thrown me into the deep end, to fantastic results – looking at you China Mieville and Iain M. Banks! ), or you’re willing to take 5 minutes to do a little research by reading Czerneda’s informative and entertaining Big Idea post over at Scalzi’s Whatever, you’ll do fine. If you’re the kind of reader who prefers to have everything explained right off the bat, you may prefer to start earlier in the series. Generally speaking, Czerneda is the kind of author who simply doesn’t explain things right away – part of her character’s journeys involves discovering for themselves what’s going on, and how, and why. and when I say “discovering for themselves”, I don’t mean coming of age (although some of her novels would qualify as coming of age), I mean discovering genetic secrets and information that could tear apart an entire society and species. We’re talking big picture here. This review does have SPOILERS for the first books in the series, and some SPOILERS for This Gulf of Time and Stars. The Clan look human, but aren’t. Telepathic and able to teleport through the M’hir, they breed among themselves for stronger telepaths. More often than not, marriages are arranged by families or the Council. You can choose your friends, but you can’t really choose your child’s parent. Like Star Wars, Czerneda wrote the middle trilogy first (A Thousand Words for Stranger in 1997, The Tides of Power in 1999, and To Trade the Stars in 2002). This trilogy follows Sira de Sarc, who thanks to their breeding program, may be the most powerful telepath the Clan has ever seen. She’s fleeing those who would control her, and finds safe haven with Jason Morgan, a human cargo trader. Morgan becomes an ally, but the Clan is still obsessed with Sira’s genetics. When everyone else in the Trade Pact universe learns that a group of secret telepaths who can pass for human have been hiding in plain sight, fear and racism sets in. But where did the Clan come from? To address this, Czerneda wrote the Stratification prequels – Reap The Wild Wind in 2007, Riders of the Storm in 2008 and Rift in the Sky in 2009. We go back in time a few generations, to when the Clan, who at the time were known as the Om’ray, were living peacefully on the planet Cersi in enforced balance with two other intelligent species. The balance is broken, and a portion of the Om’ray are forced to leave Cersi forever. Although my summary has focused on the big ideas of the series – species survival, biology, ecological balance, evolutionary quandaries, these are also character driven, intimate stories. It’s the perfect combination of space opera, anthropology, unexpected humor, family drama and romance. For example, the opening scenes of This Gulf of Time and Stars is a baby shower. When you strip away the politics and the exile and the evolutionary traits, what’s left is a family, an unborn baby, and all the drama that can go with that when your parents don’t approve of your spouse. It’s an opening scene that endearing, surprisingly funny, and gently welcoming to new readers, while at the same time it introduces the important characters, the situation, and offers a glimpse into the galactic society that is Trade Pact space. Fans of this series are used to characters being on the run. Someone is being pushed towards exile, or they are fleeing imprisonment. This Gulf of Time and Stars is the opposite. There is plenty of action and suspense, but Sira and Morgan and characters they pick up along the way are more running towards something than away. Someone, or something is killing off the Clan, turning a population of just under a thousand into a population of under two hundred. With no where to go, and nothing left to lose, it’s time to take some risks, because right now anywhere is better than Trade Pact space. When Sira learns she’s expecting a baby, a whole new set of questions arises, which I can’t even get into without spoiling the second half the book. Let’s just put it this way – if the answers you sought threatened to destroy everything you thought you knew about yourself and your family, would you keep looking for them? Isn’t it sometimes better not to know? maybe there was a reason the Clan tried to forget where they came from. If Sira opens that door, she can never close it. Will her family thank her, or curse her? You know that “show, don’t tell” thing that authors do with Worldbuilding? Czerneda does it with characters, and it is amazing. I feel like I know more about Jason Morgan than I know about real life people I’ve known for years. And she didn’t tell me anything about him, she showed me. The murals he paints on his ship, the types of gifts he gives people, his dry sense of humor, his understatedness. There is no infodumping here, you learn about everyone through their reactions and interactions. Czerneda has this incredible, yet casual and conversational way of character building that I really enjoy. As a first time reader in the Clan Chronicles, i’ll admit that yes, I felt a little in the deep end. I read the first few chapters twice, which helped. But I picked up on what was happening pretty quickly, and the compelling and entertaining plot kept me turning the pages. Stay tuned for a really cool blog event I’ll be hosting with Julie Czerneda! 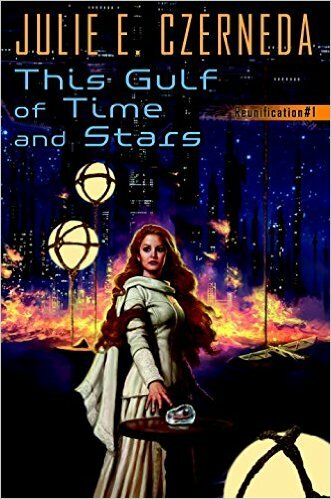 8 Responses to "Review of This Gulf of Time and Stars by Julie Czerneda"
I’m still new to reading sci-fi (and you have so many great recommendations!). “You see, there are times when it isn’t enough to think outside a box, you need to blow it away. Science fiction is that to me. A potent blend of reasoned questioning and eye-popping wonder. Permission to take risks and make extrapolations. To grasp for ideas that are both incredible and essential, in hopes of better understanding, well, everything. Go over the hill. (I’m very impatient with things like hills.) See what’s there.” Love this! Sounds like an author I must try!! Nice review! A little different than others I’ve ready. Can’t wait for the new book.